Egg white peptide is gaining increasing momentum in wide range of cosmetic as well as food applications. Owing to rapid inclination towards consumption of protein supplements, demand for egg white peptide has witnessed a significant growth across Asia Pacific in the recent years. In addition, increasing use of egg white peptide in therapeutic treatment of cardiovascular diseases has been a driving factor for egg white peptide market in this region. According to a report published by Fact.MR, the egg white peptide market is expected to witness a robust growth in Asia Pacific. Apart from the high adoption of egg white peptide as a health promoting food ingredient, growing health club industry in Asia Pacific region has also influenced the growth of egg white peptide market. More than 31,000 health clubs are functional in Asia Pacific region in 2017 which is anticipated to grow significantly in the future. Moreover, being a rich source of protein, the demand for egg white peptide is largely driven by rising health-conscious population in this region. According to Fact.MR’s study, egg white peptides have high growth prospects in Japan owing to their cosmetic applications. Egg white peptide is one of the main ingredients for skin rejuvenating creams that promotes new cell growth. With growing aging population in the country, Fact.MR foresees a higher demand for egg white peptide in cosmetic industry in Japan in the coming years. High prevalence of cardiovascular disease in overall Asia Pacific region is expected to promote the growth of this market. According to the report, egg white peptides play an important role in developing bioactive peptides that prevents number of risk factors associated with cardiovascular diseases. While Asia Pacific continues to dominate the global egg white peptide market, the global outlook remains optimistic. Fact.MR’s research study anticipates the global egg white peptide to register a relatively high CAGR of 13.8% during the forecast period 2018-2028. In terms of revenues the egg white peptides market is likely to surpass US$ 500 Mn in valuation. Food & beverage sector accounts for the highest share in global egg white peptide market owing to its advantageous factors in extending shell-life of foods and preventing microbial infections of gastrointestinal tract. Within this sector, there has been an increasing demand for egg white peptide in baking industry which holds 30% of the total consumption in terms of volume. 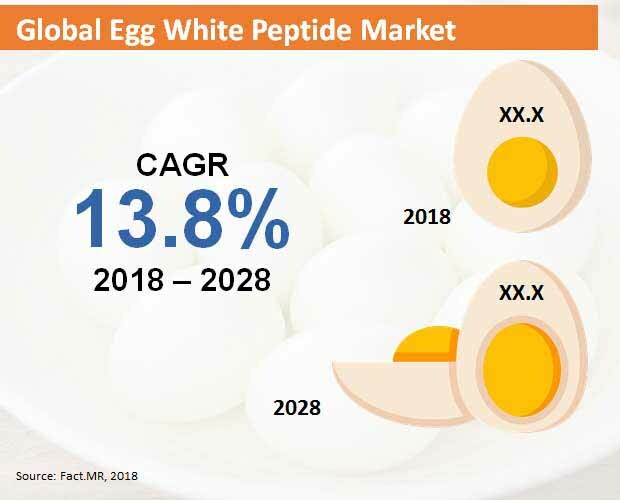 The end-use industry segment of the global egg white peptide market has been envisaged to reach an incremental value opportunity of US$ 150 Mn during the forecast period. Although Fact.MR illustrates potential growth opportunities of global egg white peptide market, several challenges such as concerns associated with animal welfare using the cage systems and increasing cost of feed are likely to hamper the growth of this particular market. The reports also highlights detailed insights of the key players participating in the global egg white peptide market. Some of the companies currently operating the market are Kewpie, Newtricious, Merck KgaA, Maypro Industries, Herbal Innovation, and Deb-el Food.